Spotlight on Service is a recurring feature in which employees share how they create positive customer interactions. In this segment, we spoke to Dwight D., a Rental Agent at Greensboro Airport in North Carolina. Dwight joined the Enterprise team in 2012 after a 35-year career with the U.S. Postal Service. Customers who interact with Dwight affectionately refer to him as “Double D.” They’re drawn to his infectious personality and exceptional customer service. In fact, in January alone, Dwight received over 20 customer emails raving about their experience. Q: Tell us about your unique approach to customer service. A: I value each customer’s business and take the time to create a personal experience. It can be as simple as talking to them about their shoes or their travel plans, but it has impact. Customers constantly acknowledge my attention to detail. Some families travel with a lot of luggage. I take notice and jump in to help with their luggage transfer. Customers are always thankful for the kind and genuine service. Q: What recent customer encounter stands out and how did you assist that customer? 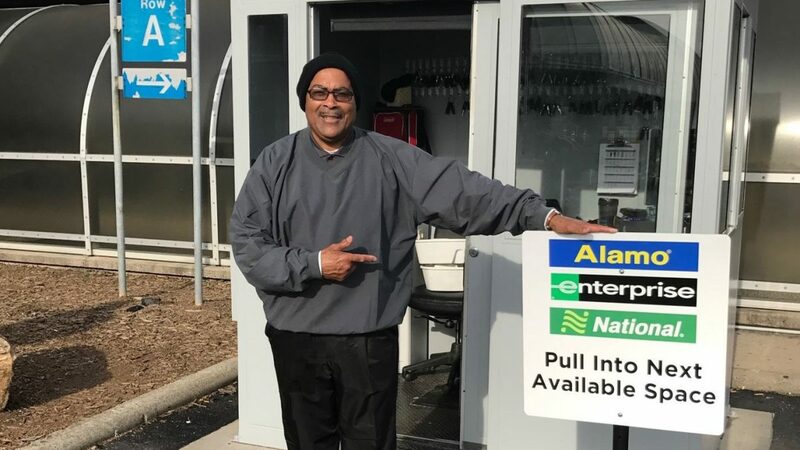 A: A customer was returning her rental car at the Greensboro Airport. Her flight was cancelled the night before forcing her to drive overnight in the rain from Roanoke to Greensboro. When she dropped the car off, she realized she forgot to get gas. She was traveling to a funeral, and I could tell she was upset and exhausted. That’s when I knew I had to provide compassionate customer service. I told her everything was going to be OK and helped get her belongings under a shelter so they wouldn’t get soaked in the pouring rain. She told me I was an angel sent from heaven – I can’t think of a better compliment. Q: What is your reaction to these compliments? A: I thoroughly enjoy what I do for my customers and team. The depth of your service determines the width of your reward; so I view these emails as a wonderful reward for my services. My attitude will touch them way before my message or approach does. Customer service is a way of life, and I step up to the plate to provide great experiences for each and every customer. Q: Who are some people within the company that inspire and encourage you? A: I work with a great team who provides top-notch service. I’m truly happy when I come to work. Some of my peers even come to visit me after a long day, and I’m happy to cheer them up. I feel fortunate to have found a great home at Enterprise.